Europe’s biggest draw takes place on Tuesdays and Fridays in Paris. Play with us and go for the same prizes, including the jackpot! Pick your numbers and play – it’s that easy! Select five numbers from 1-50 and two extra numbers from 1-12 for each line you want. You can also choose your numbers by selecting our QuickPick (Quick+1) option. After that all you need to do is submit your bet. Players across 10 European countries await the announcement of the all important EuroMillions winning numbers from Paris. The UK currently boasts the largest EuroMillions jackpot winner, will you be the next? Since 2004, millions of fans have played for a minimum jackpot of €17 million that can build up to €190 million, while regular Superdraws (which start off at a minimum of €100 million) create the potential for huge rollovers. Now you can enter multiple lines quick and easy with a Combo bet at Lottoland. Pick more than five main numbers or more than two Stars in any field and the playslip will automatically combine all the different possible lines. The more lines you have, the better your chances to win millions! 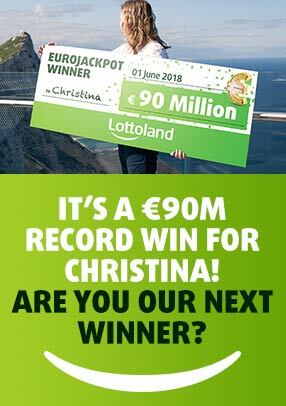 Have you played EuroJackpot yet?